Dual tees designed to challenge all - the pro tees are placed at varied locations and add more than just length. The area is very wooded, but the fairways have been cleared. Stone benches at every tee and the course incorporates innovations for erosion control (for example, large diameter pads around each basket prevent erosion). There is a dedicated practice putting area. Bring the map to navigate as tee signs may be missing. From Downtown Austin; take IH-35 South over Lady Bird Lake and exit for Riverside Dr. Turn left on Riverside and proceed to a left at the small traffic signal for Lakeshore Dr. Go to a left at the T-intersection onto Pleasant Valley. Go north to a right at the first red light by the fire tower into that parking lot. Follow the road all the way to the last parking lot area. Follow the sidewalk over the bridge to the 1st tee on the right. Excellent course, very difficult, mostly due to length. Bring water but one of our favorite summer courses because of the great shade. A bridge got destroyed by flooding between the Krieg baseball complex and the first tee, but still accessible. Pro tees are for pros on this one! Using a map will be helpful as getting to hole one from the parking lot is confusing for first timers. Use the main hiking trail to get to hole one which is a little walk from the parking lot.Bring some arm as the course is long. Very nice tee boxes with good hole signage and shade is a plus. 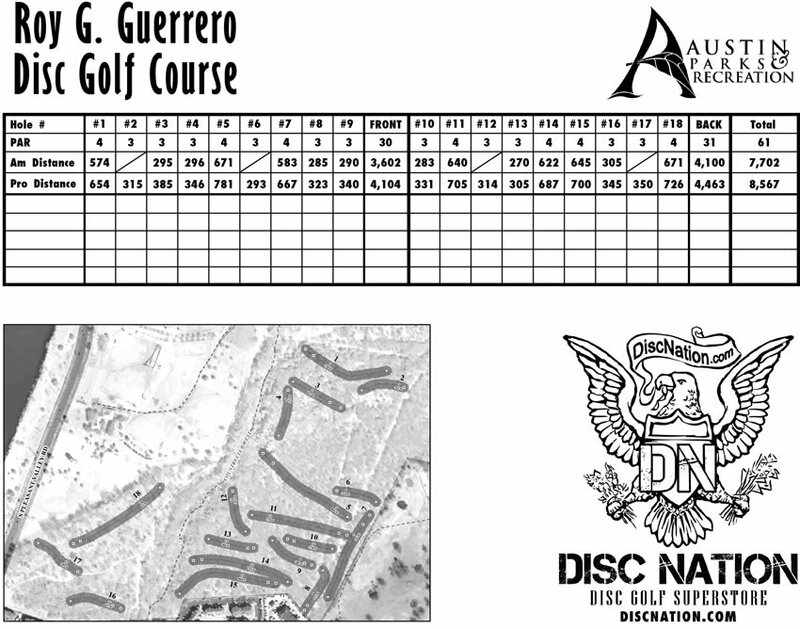 Most of the course is shaded as your throwing under and around trees, lots of trees. The grass was a little tall when we played but I assume they mow it every now and then. The tee pad to 16 was a little confusing but just follow the path to the left of 15 basket, across the creek and straight up the hill. 17 basket has a great view of downtown Austin. When you finish hole 18 you will have a VERY long walk back to the parking lot. Taking the concrete path by the baseball fields and then taking the hiking trail by the washed out bridge past hole one is the fastest way back. Next time we will park by the baseball fields and walk to hole one with fresh legs and finishing on 18 by the truck. This was a great course to play but the layout should have been better so you finish where you started. The course is also cart friendly.